← The Summer that Melted Everything is Hot! Unabridged Audiobook, 9 hrs, 40 min. This one is my least favorite in the series (I think, I’m pretty sure, anyway) — Atticus is held to promises he made in the last book, which brings him into contact with the Norse pantheon — particularly Thor — and knocks over the dominoes that will change the lives of Atticus, Granuaile, and Oberon forever. 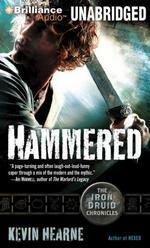 This book prevents the Iron Druid Chronicles from being a Dresden Files-Light series, which I’m glad for. But it just doesn’t work that well for me. Oh, I could point to passages that are stirring, well-written, thoughtful and so on — some of Hearne’s best action scenes are here. He’s got some great character work going on, too (Perun was one of my favorites from the start). I just think Hearne could’ve done better. Some of Hearne’s funniest material is in this book — Atticus’ internal monologue where he replaces the angel/devil on your shoulder with a Spock and Kirk combo, the stuff about American beer, Oberon’s extended rant about Bacon Lattes from Starbucks. Just great. Sadly, the story surrounding all that just doesn’t hold up too well. Luke Daniels solidified his place as my favorite Audiobook narrator with this one — I laughed out loud at and loved his Ratatoskr. I don’t think I mentioned in the last book how much I appreciated his Coyote (and if I did, it bears repeating). His accent work was good — just everything. He even elevated the slow part of the book — the sitting-around-the-campfire, telling-stories-about-what-a-jackwagon-Thor-is chapters. Not my favorite, but for who it introduces, what it sets up — and for the completest in me — worth your time. It’s probably a victim of Hearne’s rush to finish the trilogy to fulfill his very quick publishing contract. Which just means it gets better from here.